During the 1920s, corporate leaders consolidated their authority over the economy and their high standing in public life. Then, the Great Depression of the 1930s loosened their hold signficantly. But, as Kim Phillips-Fein writes, even as the New Deal gave added powers to workers (through new industrial unions) and to the state (through new regulatory mechanisms), corporate leaders regrouped and began to organize against these changes. 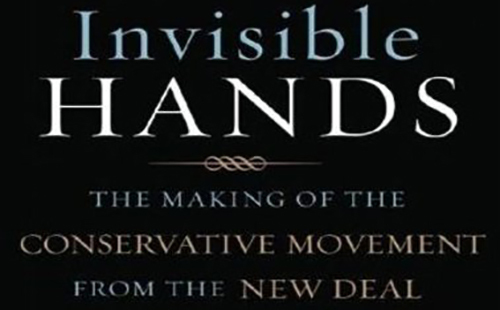 A study of a long-developing political movement, “Invisible Hands” shows that, while corporate conservatives elicited little support during the 1940s and early 1950s (even sometimes from within their own ranks), their efforts at establishing new think tanks and political advocacy organizations eventually transformed the discourse (and legislation) of American politics, ushering in an era of deregulation, union busting, and increased economic inequality. The interview explores this transition and looks at the acceptance by Democrats of conservative arguments about the market. Phillips-Fein also draw potential lessons for progressives now seeking to build a movement.